And to make sure that you get as much from this set as you can I have included many more ideas and folds for you to try. You will find the links to them all and I hope you will give some of them a try. The piercing is such an effective look and very easy to do and yet adds so much extra dimension to your creations. It is easier to do with the right tools and I have used the Tim Holtz design ruler and a pricking tool. This handy little ruler has a metal edge along one side and holes on the other to add the piercing. It has grid lines that will help you to do a multitude of thing s and because it is clear you can see where you are going along the edge of the card. 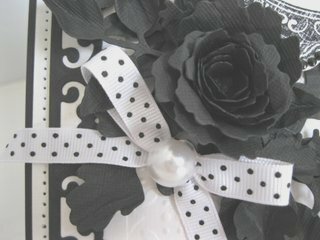 The card has been created to a monochromatic scheme but with the ribbon and flower nothing is lost for the lack of colour. 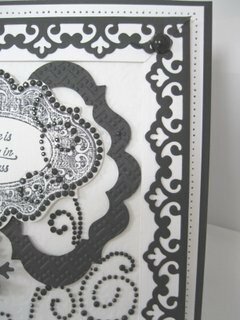 Another addition is the black pearly swirl along the right hand side that gives much more richness to the card. 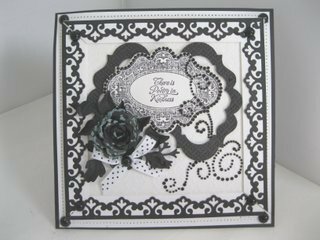 This is just one of many beautiful designs from Want2Scrap and they come in several colours and other shapes to co-ordinate with many of the Spellbinder dies. Make the card in any colours that you have but have fun with yet another idea ... Pierced Edges and Spellbinders.